A Murder Mystery Wedding — Sweetchic Events, Inc.
As I mentioned last week, my clients Stephanie and Chris who got married at the Chicago Botanic Gardens, were not the dancing type. In fact, they preferred not to be the center of attention, a difficult feat on your wedding day! So we contacted The Murder Mystery Co. to create a wedding reception unlike one any of their guests had ever attended! Since it was a small wedding of under 70 guests, Stephanie and Chris opted for the Small Party Package which included two actors for an hour and half to two hour interactive show. And by “interactive” I mean that willing guests were given costumes, props and a brief summary of their character. 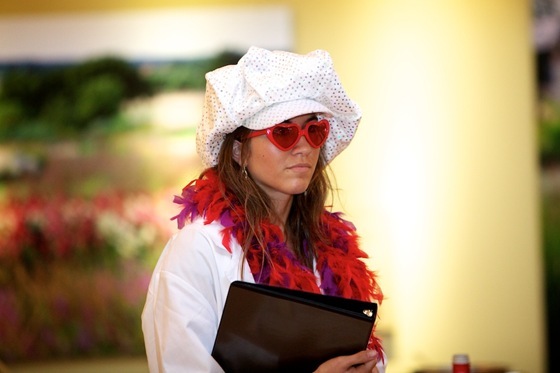 I think the success of this type of quirky wedding reception is really dependent on your guest-list…. luckily there were a number of hams in the audience who really got into their parts, and thus the show was entertaining for all! Lead MMC actor, Justin, playing the role of the mullet-rocking, handle-bar mustache wearing, Flavor Flav-wannabe Best Man… who was later murdered. Dun dun duuuuuun. He later reappears as the Detective investigating the crime. The guy on the left in the pale blue vest is Chris’ best man, and his role for the evening was that of the Groom. He. was. HILARIOUS; they couldn’t have picked a better, more willing participant. The gentleman on the far right in the top hat and pale green shirt was dubbed the CSI investigator, and he had an absolute ball with his part, which he took very seriously! The Bride in the center was also part of the MMC duo, and she was adorable. *GASP* The Best Man is dead! I wasn’t at all sure what to expect as this was my very first Murder Mystery! But MMC was awesome, I would definitely suggest this to any couple looking for untraditional wedding entertainment!